In India, over 1 million children under the age of 5 tragically die from diarrhea every year. These deaths can easily be prevented through simple education. Since 2004 Relief Riders International has made it our mission to change the odds for children in India through our Pediatric, Health & Hygiene and Educational programs. In 2011, as part of our Pediatric program, RRI teamed up with UNICEF for the first time to implement UNICEF's Global Hand washing program in which rider's accompanied by Dr. Arora taught children hand washing and basic hygiene practices at all the schools we visit. 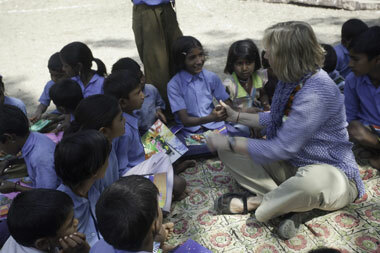 As simple as it sounds, this program has already had a big impact on children in India. Hand washing is the most cost effective way to reduce cases of Diarrhea, the second leading cause of death in children in India. Some of the simplest-seeming aid programs, such as the provision of de-worming medication and the delivery of educational supplies to small desert schools—can have overwhelmingly positive influences in these communities. Basic de-worming medication helps rural children to strengthen their immunity toward parasites that their compromised nutrition and drinking water exposes them to (thus insuring better long-term health). School supplies—such as notebooks and drawing pads, pencils and crayons, and activity equipment like soccer balls and badminton sets—similarly help children sustain a longer-term preparation for and interest in education (too often, young children in these communities are conscripted into agricultural work). Less quantifiable, but just as important, is the creative and intellectual exchange that results between children and relief ride participants. For most children in this region, the arrival of relief riders is their first experience with foreigners—and the excitement and curiosity they express during these meetings is both broadening and inspiring. Aiding children is at the heart of our mission, the excitement and gratitude we receive from them whenever we visit their schools is the highlight of our Relief Rides. Their enthusiasm is matched by our Relief Riders, who all agree that their experience helping these village children is unforgettably rewarding. We have wonderful Relief Rides planned this year, notably our Relief Ride to this year's Pushkar Fair and The Great Bikaner Relief Ride, which take us back up north, where we will ride through the Dunes of the Thar desert.